Many of my clients ask me "How much time should I invest in LinkedIn?". Some ask about ROI (Return On Investment). What do they gain? How does it affect their bottom line? What are the outcomes? Great questions and frankly - something we should all be asking ourselves whenever we spend time on the LinkedIn platform. Time spent on LinkedIn could be time spent elsewhere, so let's make it count, right? I have 2 LinkedIn Profiles, one is for people I know, the other is for people I'd like to know/better. Having 2 Accounts also allows me to experiment and test all kinds of cool LinkedIn stuff. I've been looking at SIDEBAR STATS (Views, Searches, Your Network etc.) on both Profiles recently. 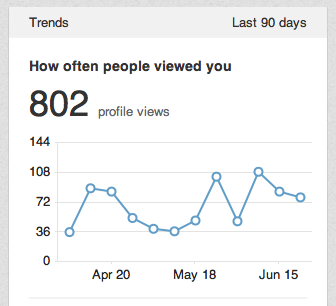 LinkedIn gives all users a line chart of their VIEWS and a weekly SEARCH stat. Paid users get 90 days of browser history. No one else can see this information except you. The answer to ROI is right there in those stats. 1. DO I WANT MORE VIEWS or SEARCHES? (1) You know for certain that someone has actually viewed your Profile. (2) You can influence views efficiently by your own actions on LinkedIn. (3) LinkedIn provides multiple opportunities to engage in activity which yields views. (4) Views, just like clicks in SEO (Search Engine Optimization) terms, are valuable. (1) You don't know for certain that searches equate to views. (2) Keyword-stuffed Profiles will always win in searches. Keyword-stuffing has downsides. (3) There are too many factors beyond your control which influence searches. (4) Searches are not clicks and are difficult to assess in terms of value. 39% of LinkedIn users have a paid account* and my guess is that the primary reason for paying for LinkedIn Premium is to know who is viewing your Profile. Non-paying users will be tempted to pay now that they are seeing their popularity mapped out in a chart plotting views (or browser traffic). I decided to experiment with getting my views boosted and 'off the chart'. I used a combination of 5 techniques, they worked, beautifully. My bench-mark Profile shows views zig-zagging between a range of 36 to 108 weekly. My daily average of views for the bench-mark account is 8.91 (802 ÷ 90). The test account was around 250 views per/week prior to implementing the 5 techiques. But, I've managed to boost views on my other Profile by 200% (250 to 750 Views), using the 5 techniques! Daily average views for the test account is currently 41.98 (3779 ÷ 90). The test account has 371% more daily views than the bench-mark account. What level of traffic would you want on your site? 9 views per day or 42? My guess is that most people who do the bare minimum in terms of activity on LinkedIn get between 3-10 views per day. 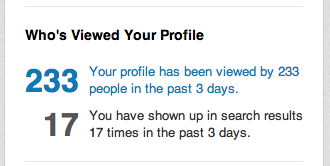 But, I got an average of 77 daily views over three days last week. 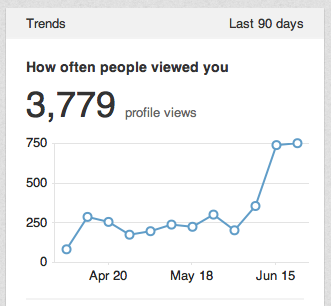 The tested Profile will garner in the region of 12,000 more views over the course of a year than the bench-mark. Wow! Side by side comparison between bench-mark profile and test profile using 5 techinques. - Both have 'vanity' urls. - Both have a 100% complete Profile. - Rich Media is abundant on both Profiles. - I've chosen the maximum Skills (50) for both. 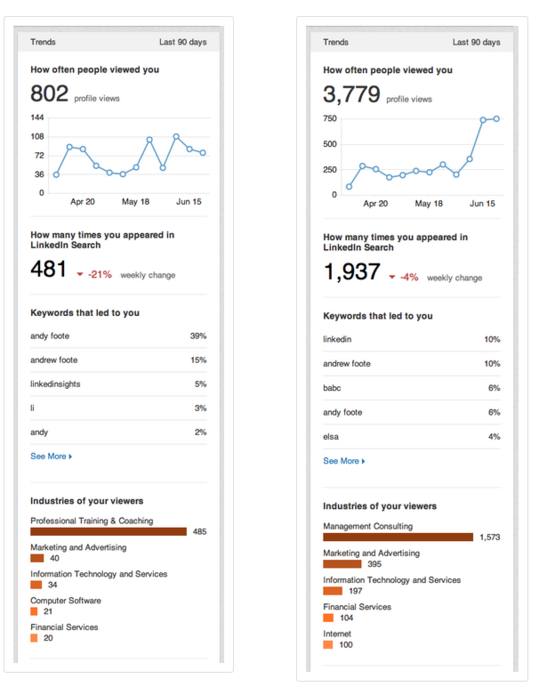 - Both Summaries tell my professional story in less than 250 words. - I've got the same Premium Account for both (which costs $95.40 per/yr per account). - Both have a photograph where I can be identified in all 3 of the LinkedIn sizes. - I've joined 50 Groups in the test account. I've joined 42 in my bench-mark account. - 2,349 1st Degree Connections on test account. 426 1st Degree Connections on bench-mark account. - Followed 115 Companies/Organizations in test account. 198 followed on bench-mark account. - Rich Media: 5 Blog articles on test account. 10 articles on bench-mark account. I'm calling this the "View Boosting" strategy. 5 effective techniques, taking approximately 10 minutes a day to implement, working together to cause a cumulative jump in views of a Profile. If you want to know exactly how I achieved this 200% boost in daily LinkedIn Profile views, I'll show you for $15. That's less than what you spend on coffee or donuts this week. Simply send your payment to my PayPal ([email protected]) and I will email you an easy to follow, 3 page pdf guide providing an overview with details of the 'View Master' technique. What value do you place on having thousands of professionals actually viewing your LinkedIn Profile this year?